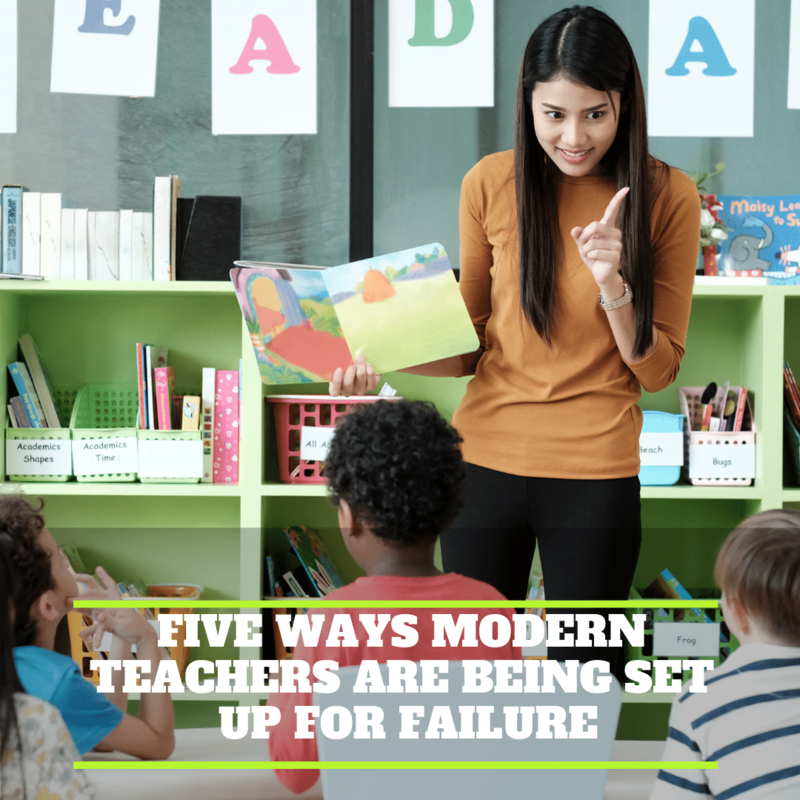 Why are so many American teachers being set up to fail? As a mid-career classroom teacher, my hopes are relatively simple. I want to teach my subject to receptive, well-behaved students in schools with a clear and consistent academic mandate that are safe, well-funded, and nestled within a broader culture that respects the professionalism of the teachers while simultaneously encouraging innovation, rewarding excellence, and building vertical opportunities for teachers as they progress through their careers. Not too much to ask. Is it? On most counts, I am absolutely blessed. But the problem is a lot of teachers in the country are not. The truth is many teachers are starting to feel spectacularly sabotaged these days—undermined at best, steered towards colossal failure by powers that have no idea how they are subverting the very student populations they mean to serve. I am not talking about my individual school or district. The wide spectrum of “education experts” are broad in their locations and deep in their influences. A sinister smorgasbord of forces, influences, and voices in American education have morphed into a discordant chorus that endlessly issues diktats, decrees, edicts, and commandments to classroom teachers that not only make their jobs harder but fail to serve the students we mean to educate. The number of conflicting policies, advice, and training teachers are expected to endure these days is something out of a poorly written YA dystopian novel—part tragicomedy, part farce, and wholly ridiculous to teachers who really just want to be left alone to do a job they love. In short, many feel like they are being set up to fail. #1: Never Ending Reform: The United States never stops participating in what I call, “The Magical Solution Illusion” –the mistaken notion that there is actually “a solution” to what ails American education. This is a dangerous and precarious notion for the following reason: it situates education into a paradigm as if it is a disease or one of those famous math problems that no one has ever been able to solve, like the “smooth four-dimensional Poincare conjecture.” All we have to do, the thinking goes, is find a panacea or a classroom pill for everyone to digest and all will be well. In this sort of pattern, the educational intelligentsia is constantly formulating and advocating for new and better ways of delivering education to American students. Why does this set up American teachers for failure? Simple. We can’t master one trend before the next one is already being implemented. To paraphrase a friend of mine: First, you have ESEA in the 1960’s with every president putting his own perspective on it. Then NCLB. Then PLC’s. Then RTI. Then CCSS. Then ESSA. And of course, we have our own acronyms today—PBIS, SEL, and RP. Let us not forget the most galling element of this endless reform. It always, seemingly without exception, puts more responsibilities onto the classroom teacher. Teachers wonder: is it a coincidence that PLC’s encourage teachers to take responsibilities for other failing teachers? Is it a coincidence that restorative practices keep students in the classroom and not in the dean’s office? Is it just chance that social-emotional teaching now mimics in many ways the responsibilities of the traditional high school counselor? This is nobody’s fault per se, especially the schools and districts implementing these programs that they have no choice but to implement. But it goes to the heart of how teachers often feel set up to fail. #2: Extreme Parenting: More than a few teachers have noticed that parental styles have become more extreme as time goes on. On the one hand, there are parents who are usually labeled, “Helicopter Parents” because they hover over their children at all times, stifling their capacity to become independent. The more recent nomenclature is “Lawnmower Parents” because they mow down every obstacle that stands in the path of their children. In both cases, the expressions describe a parenting style in which the main objective is to make life easier for children. This often includes making life easier for their children at school. This can be positive when it empowers schools to root out behaviors such as bullying or marginalizing specific student populations. But it can also be a thorn in the side of teachers who dare to believe that sometimes school is supposed to be challenging. The other extreme is the parent who provides very little support for his/her child. Sadly, the manifestations of parental neglect are too numerous to enumerate. Everything from behavior, grades, and values are in peril when young people do not have strong adult relationships in their lives. When these influences are absent, we deceive ourselves into believing that teachers can wholly fill this vacuum of influence, or even that they should. They can help. They can certainly be a force for good. But any teacher of substance will tell you they cannot take the place of a loving and involved parent. It is not so much that the modern-day educator is expected to fix everything. It is that we are supposed to confront the varying degrees of familial, civic, and economic failure with great pedagogic aplomb and yet find a way to succeed. And yet a dizzying list of hurdles for the modern educator—devices, anxiety, violence in schools, drugs, student loneliness and isolation, standardized tests, new trainings, poverty, poor health, malnutrition, absent parents—is evidence that teaching sometimes comes last after satisfying the basic needs of the students sitting in our classrooms. The list of people we are trying to satisfy on a daily basis is exceptionally long: principals, parents, students, colleagues, the public itself. Many of these people have different and conflicting ideas about what a teacher is even supposed to be doing. What is primary these days? Content? Emotional well-being? Social skills? In an attempt to satisfy everybody, we often satisfy no one. It is almost as if we are being inadvertently set up to fail. #4: Relaxing Rigor: Here is the dirty little secret educators know to be true: simply getting a high school diploma is laughably easy. Some junior highs literally have no grade requirement for moving on to the next grade. A student with straight F’s gets to move on to the next grade. Once in high school, teachers across America are well aware they are judged not by the rigor of their courses or the excellence of their instruction, but by the number of students passing the course. This is not anecdotal, either. How can any other conclusion be reached when graduation rates are at all-time highs and reading and math scores are simultaneously in a steep decline? College remedial courses have skyrocketed. College attendance rates peaked in 2011. Moreover, the push towards universal college attendance has had the deleterious effect of denigrating unconventional pathways towards a career. As the Washington Post noted earlier this year, “This system misses myriad talents and paths to success in the United States. It under-appreciates the massive performance debt that student from poor families and districts face as a result of hunger, health issues, and more; devalues vocational and technical pathways; discourages nonlinear paths to success . . .”. #5: Teacher Pay: The average teacher pay in the United States is $59,660. When adjusting for inflation teacher wages in real terms have declined by 3% in the past decade alone. Time Magazine featured a series of provocative covers earlier this year detailing the financial struggles of the everyday classroom teacher. Each one had the words “I’m a Teacher in America” splashed at the bottom of it. To be clear. Many teachers—myself included—do not feel particularly unpaid. But that is because I come from a state, California, that pays its teachers relatively well and offers a generous retirement plan. Couple this with the fact that I live in an area of California with relatively low real estate prices. I can work summer school, take a home student, or offer to work during my prep period to make additional money. Sadly, however, my situation is not the norm for many of the teachers in the country. The link between salaries and failure correlates not so much with the experienced educator, but with new teachers. The average starting teacher salary in the United States is $38,617. Keep in mind that unlike other western democracies that often subsidize or completely fund credentialing activities, in the United States aspiring teachers are usually on the hook for their own tuition costs. Moreover, student teaching is almost always gratis which requires long stretches of time with a heavy work load and no income. This is obviously a disincentive to anyone who does not have the necessary support to go to school and student teach without an income. When young, bright Americans consider the careers they wish to enter, the reality of early financial hardship is not particularly enticing. By starting salaries so low—in some instances under $20,000 a year—it signals to young people that financial success will probably elude them. And yet, if we were serious about encouraging the most educated and capable Americans to enter the classroom, then the correct incentives would need to exist. This is a rare point of intersection for liberals and conservatives. Liberals would heartily embrace higher teacher pay and higher teacher pay would increase competition for teaching positions, which conservatives would certainly applaud. Teaching should not require a vow of poverty for people entering the profession. Until this changes our system is set up for failure. You say, “It is not so much that the modern-day educator is expected to fix everything.” But I think that *is* in fact the modern-day expectation. Just look at how many of societies ills are blamed on teachers! By the way, you mention teacher pay, but perhaps more important when it comes to being set up for failure, you neglect to mention the lack of resources provided in the modern classroom. Think about this: a special deduction was incorporated into the tax code for school supplies purchased by the teacher! By the way, let’s not forget that many of these educational reformers have little to no background as classroom teachers. We really shouldn’t take seriously any of their suggestions until they themselves try implementing them in an actual classroom setting. To piggy-back on the previous post, many of the state and school district officials making policy or decisions concerning the direction education should take have little or NO classroom teaching experience. They may not have ANY education experience at all! How can someone direct what goes on in the classroom if they have never experienced the problems first hand? Couple that with technology disconnects between student and school resources. The school goes out and purchases an expensive software package that has “all the bells and whistles” but, there aren’t enough access to computers at school and students don’t have access to computers or no internet service at home. What is the point of the “wonders of technology” if the kids can’t use it?